Who doesn’t need cinnamon rolls on a Monday? I know I sure do! 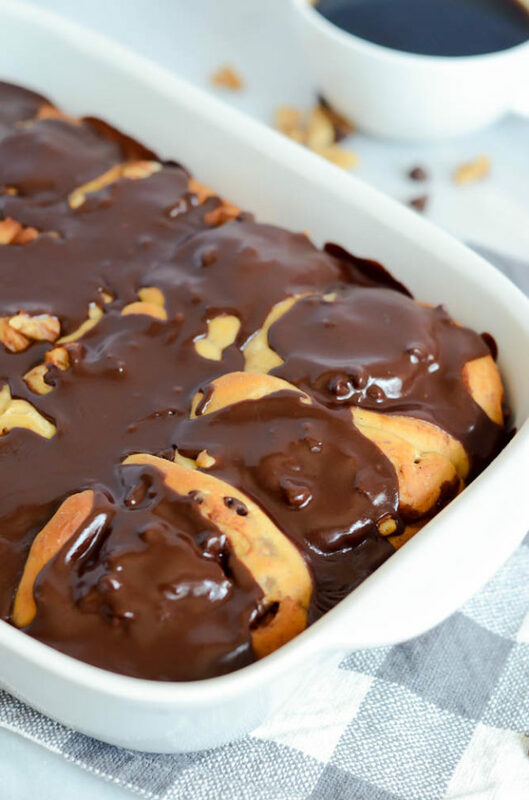 Especially when they’re loaded with banana, chocolate and walnuts like these Chunky Monkey Cinnamon Rolls with Chocolate Glaze. I don’t even think that these need further discussion, but a discussion we will have. As I mentioned in my post for these Pumpkin Praline Cinnamon Rolls with Bourbon Cream Cheese Frosting, I owe my deep love for all flavors of homemade cinnamon rolls to my Dad. Over the past couple of years, good ol’ Dad has been dreaming up different combos like Caramel Apple, Blueberry, Chocolate Chip, you name it, and if we’re lucky he’ll have some baking away in the oven for breakfast whenever we go up home to visit. Two weekends ago, we were up there helping my sister move into her new house, and my parents decided to throw a little brunch to celebrate my birthday the next morning. Sure enough, Dad was in the kitchen the night before the brunch whipping up the above-mentioned Blueberry Cinnamon Rolls, and I decided it was high time for me to feature another cinnamon roll flavor on this here blog using his trusty recipe. On this same trip, Dad and I were chatting over our coffee one early morning (as we usually do since we’re the only early-risers in the family) and he brought up the fact that it had been a while since he made his banana chocolate chip pancakes – another breakfast specialty of his. It got the gears turning in my mind and I figured, why not combine the two? 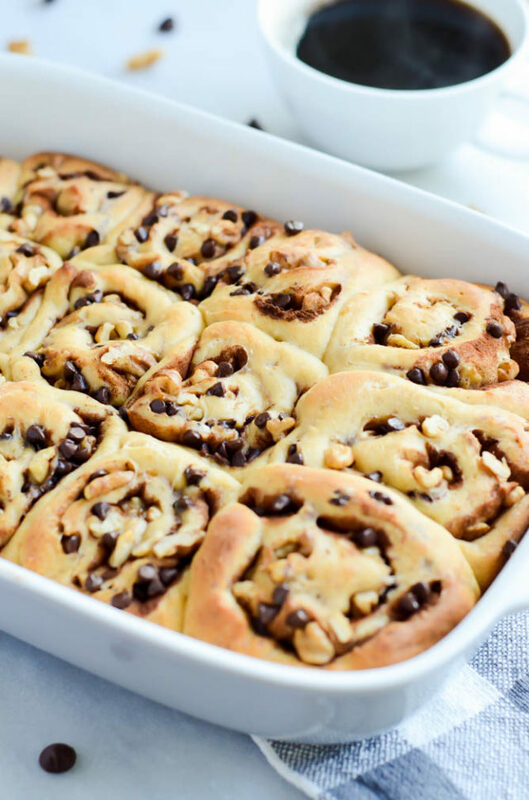 Cinnamon rolls, banana, chocolate chip….all in buttery, flaky bread form? Yes, please! I’m proud to say that these Chunky Monkey Cinnamon Rolls with Chocolate Glaze turned into not one, but two pans of delicious, indulgent, chocolate-y breakfast pastries, half of which are living in our freezer right now so we don’t eat them all in one sitting. Plus, I love having a freezer full of baked goods for any last minute house guests or mornings where we just don’t feel like cooking! 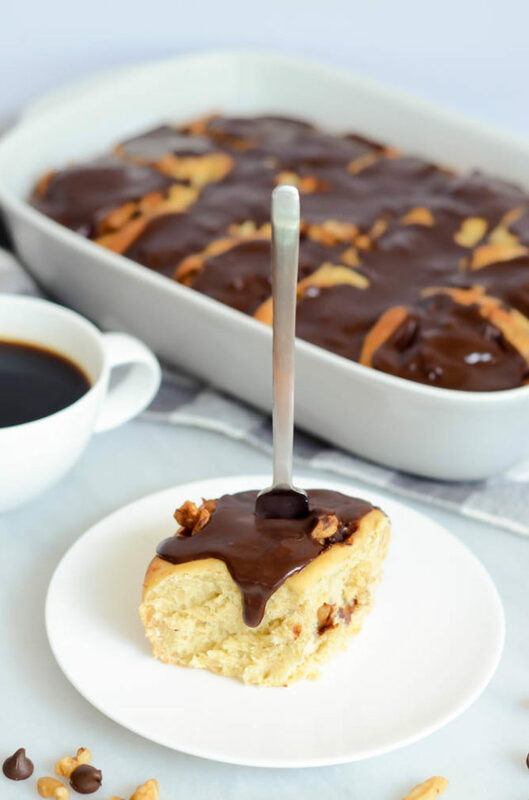 You’ll notice that the base for these Chunky Monkey Cinnamon Rolls is very similar to my Pumpkin Praline Cinnamon Roll recipe. That’s the beauty of cinnamon rolls! Once you get the basic formula down, you can swap different ingredients in and out to make alllll of the flavors. 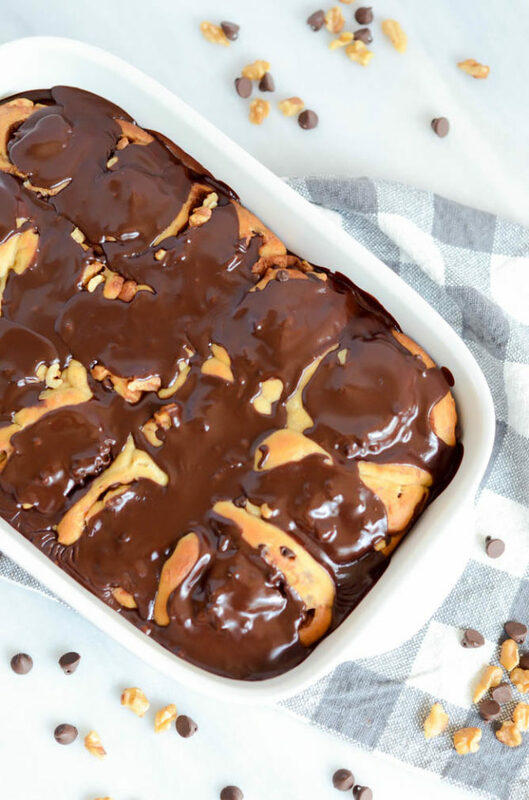 The dough for our Chunky Monkey Cinnamon Rolls with Chocolate Glaze is brought together using a stand mixer fitted with the dough hook, and is then rolled out into a rectangle over a large floured surface. This is where our banana will live, mixed into the buttery dough just like you would when making banana bread. The next step is the delicious, ooey gooey filling. The rolled out dough gets a light brushing of butter, and then a heavy dusting of ground cinnamon. 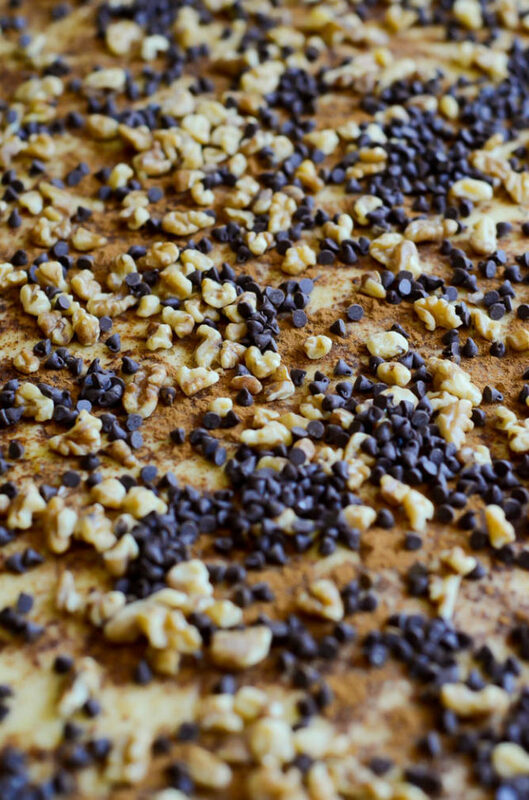 We sprinkle our mini chocolate chips and toasted walnuts over that, and then we’re ready to rock-and-roll! That’s right, time to roll up the dough into a long, tight log. I failed a bit at the “tight” part, but was able to make it work by using a rubber spatula to scrape the dough off of my marble slab (it can get a bit sticky) and guide it onto the rest of the roll. The rolling is literally the hardest part (besides waiting for the cinnamon rolls to rise!) and once you’re done with that just slice it up and tuck the spirals into a couple of baking dishes coated with cooking spray. 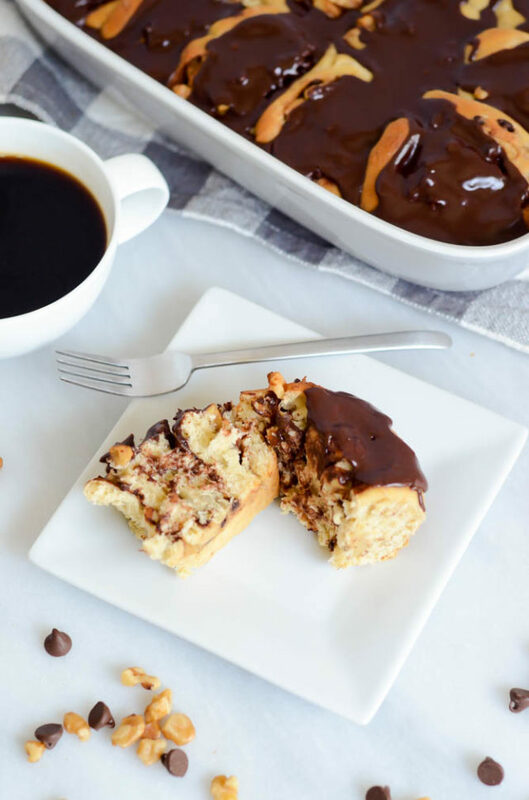 Wrap them up and stick ‘em in the fridge overnight, and in the morning you’re just 45 minutes away from incredibly mouth-watering Chunky Monkey Cinnamon Rolls with Chocolate Glaze! I like to let the cinnamon rolls have a little bit of a warm rise in the morning, and to do this I just turn the oven on to 250 degrees for about 5 minutes, then turn it off and put the rolls in for 10-15 minutes. After they’ve had some time to rise, I take the rolls out to, set them on top of the oven, and preheat the oven to the baking temp of 350 degrees. Once the oven is preheated, stick in the cinnamon rolls and in 30 minutes your house will smell like your favorite bakery – promise. And that’s it! Really, as long as you’re cool with popping the rolls in the refrigerator overnight to rise, this recipe comes together in a snap and with very minimal effort. I mean, we’re talking weekday breakfast status right here. So what are you waiting for? 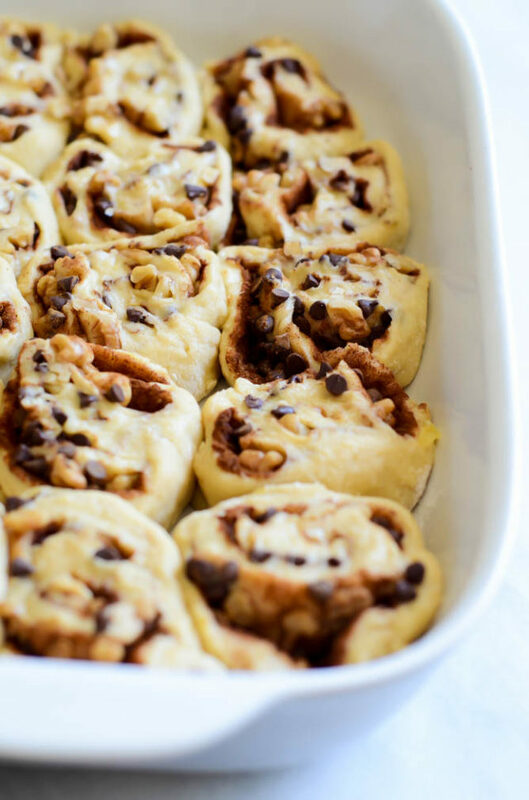 These are not your average cinnamon rolls with flavors of banana, chocolate and walnuts. Just like your favorite ice cream flavor! Keep adding the flour until the dough can be removed from the mixer without sticking too much. It will be a little sticky, but feel free to put more flour on your hands to help you get it out of the mixer and onto a lightly floured surface. Knead the dough lightly on the floured surface, adding light dustings of flour as needed, until you feel you can roll the dough out into a large rectangle. Using a rolling pin (or pizza roller), roll the dough into a rectangle that’s large enough for the dough to be about ¾ of an inch to an inch thick. You’ll want one of the long sides of the rectangle closest to where you are standing. Using a pastry brush, brush the melted butter over the dough, then sprinkle on the cinnamon, followed by the walnuts and chocolate chips. Starting at the long side of the rectangle that’s closest to you, begin rolling up the dough into one long log. Do this slowly and carefully, using a rubber spatula and more flour to guide the dough as needed. Pinch the ends into the dough to prevent the log from falling apart. Using a sharp knife, slice the log of dough into 1 ½ - 2-inch pieces. Spray a 9x13-inch baking dish with nonstick cooking spray, and place each roll snugly side-by-side. 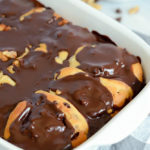 If you have extra rolls that you can’t fit in the pan, place them in another, smaller baking dish coated with cooking spray, such as a loaf pan. Cover rolls with plastic wrap and place in refrigerator overnight. In the morning, take the cinnamon rolls out of the refrigerator and uncover. Preheat the oven to 250 degrees Fahrenheit for just 5 minutes, then turn it off. Add the cinnamon rolls to the warm oven for about 15 minutes to go through a second rise, then remove the rolls and turn the oven heat up to 350 degrees Fahrenheit. Return the cinnamon rolls to the oven and bake for 30-35 minutes, or until golden brown. Remove and let cool slightly while you make the glaze. In a medium bowl, sift together the powdered sugar and cocoa powder. Add the melted butter and milk and whisk until a thick glaze forms. Spoon the glaze over the cinnamon rolls before serving. Next Post Homemade Whole Wheat Crackers: Two Ways! GET IN MY BELLY!!! These look SO stinking good. Weekend brunch can’t get here soon enough! I’ve been obsessed with the chunky monkey combo lately, and these cinnamon rolls are no different! I would love one with a big cup of almond milk!